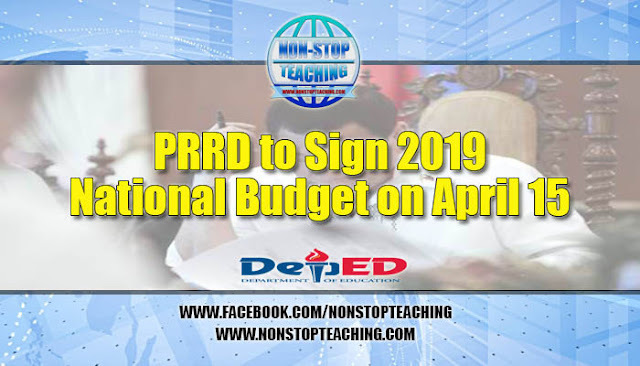 "The Palace confirms that the ceremonial signing of the General Appropriations Act 2019 has already been calendared in the President’s schedule on April 15, Monday," said Presidential Spokesperson Salvador Panelo in a statement. Panelo said the 2019 budget is a continuation of Duterte's promise of bringing genuine change in the country. "This year’s National Budget – our third under the Duterte Administration – is a continuation of our narrative of genuine change and meaningful progress through, among others, our intensified infrastructure development programs, expanded policies on human development and poverty reduction, as well as strategies in advancing the peace and order situation of the country," Panelo said. Panelo thanked the Senate and the House of Representatives for passing a budget supportive of the President's vision. "We thank the men and women of the Senate and the House of Representatives for supporting this Administration’s endeavors in pursuing a path towards the President’s vision of a prosperous and high-income economy under a secure and peaceful nation where all Filipinos can experience a dignified and comfortable life," he said. President Rodrigo R. Duterte will sign the long-delayed PHP3.7-trillion national budget for 2019 on April 15, Malacañang confirmed on Wednesday.